You sell some options, and they decay over time. Then you buy them back at a lower price than you sold them. Simple, easy, profits. 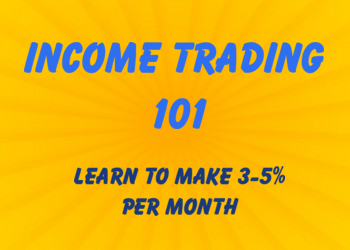 With iron condor trading, that's how it works 80% of the time. Because the market tends to overestimate risk, you can sell premium and be richly rewarded. Yet, there's a catch. Sometimes, many times, you'll get caught on the wrong side of the market, and you'll have to adjust your trade to cut your risk down. We've already covered iron condor adjustments. If you haven't read up on that, I highly recommend it. Yet what if we could do something about our risk before it gets out of hand? 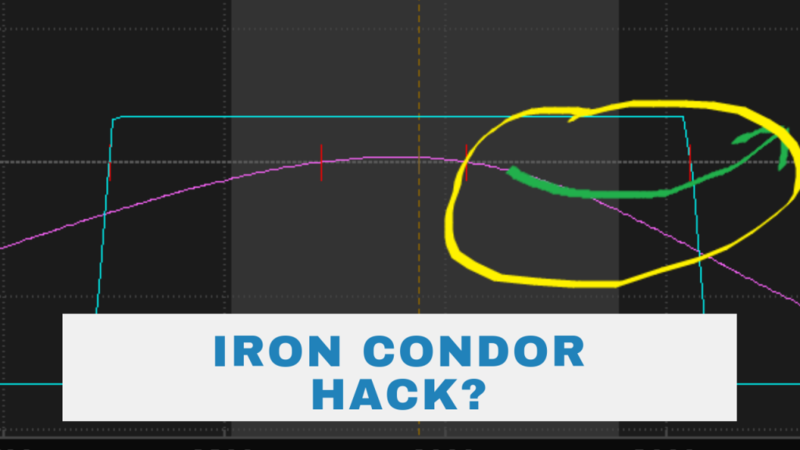 That's what I'll be showing you today-- a simple hack that can enhance your returns and reduce your risk in an iron condor trade. Get Your FREE Iron Condor Toolkit. You'll see live case studies, free training videos, and my Iron Condor Lifecycle Journal. 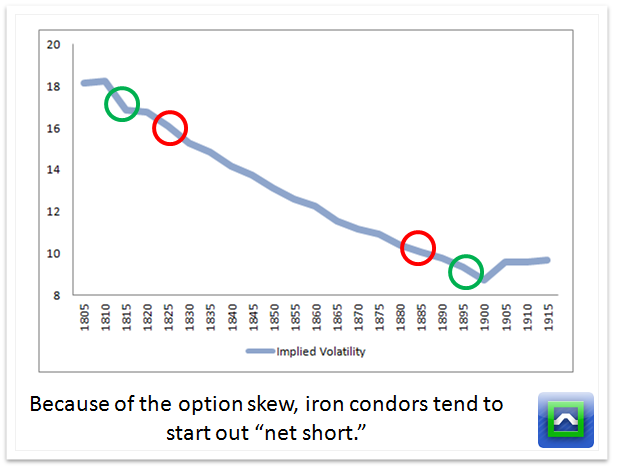 It seems like no matter what you do, you always end up with an iron condor that is net short. When you actually think about it, it makes sense. 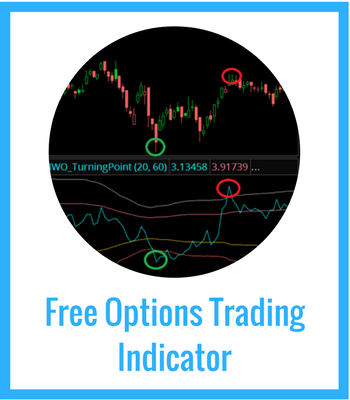 Because of the option skew, there will not be as much premium available on the call options and you will have to go a little closer to the current underlying price. Do note: this applies mainly to equity options. Commodity options like gold and oil can have different volatility curves so this issue won't come up as often with those assets. That leaves you with a little problem. Iron condors are short vega plays, which means that if the implied volatility goes down, you can make money. But most of the time, the only way for implied volatility to head lower is if the market rallies. And since your iron condor is net short, the directional exposure cancels out any gains from the drop in implied volatility. In terms of greeks, your delta risk cuts into your vega rewards. There is the third greek, theta... the decay of options over time, and that's where the real rewards come into play... but what about if the market starts to grind higher? This is an iron condor with the short options at the equivalent delta-- we do this to stay consistent across different asset classes. The max reward is 1.10, and the max risk is 3.90, which leaves us with a maximum return on risk of 28%. But what if the market rips higher? 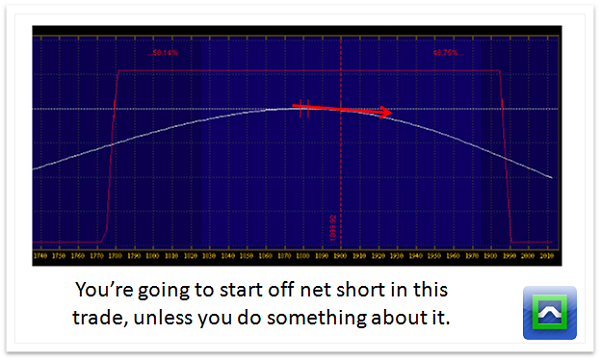 Since you already started off net short, you're going to be stuck at a natural disadvantage during bull markets. Your bet that a market stays rangebound starts to sour. The rally doesn't see a pullback, and then the market rallies some more. Yeah, I've been there. More times than I'd like It's not fun. There doesn't seem to be an easy way out. Any attempt to cut down on your net short exposure will either lead to your reward going down or your risk going up. Well, I've discovered a little hack that you should consider when putting on a new iron condor trade. 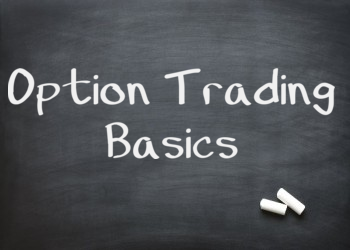 There's a few methods to consider-- buying calls, call spreads, ratios, kite spreads, time spreads and so on. But one simple idea has made my iron condor trading a lot more profitable. ... I get short the VXX. By buying puts. Upside Risk Goes Down. Because the VXX runs with a negative correlation to stocks, getting net short VXX can give you upside hedging against the market. Upside Ripping Risk Goes Down. If the markets have a ripper of a rally, the gamma in the long VXX puts will help to soften the blow and allow you to adjust the trade on much better terms. It's An Extra Short Vol Trade. The VXX gets short VX futures, so it piles on your short implied volatility risk. And if the market sells off you will make money on the iron condor and lose on the VXX puts, so they help to hedge each other off. It Makes Money Through Contango. A normal volatility curve leads to the continued grind lower in the VXX, so you can actually catch some outperformance if the market stays quiet. The tradeoff with this is that you do lose out on higher profit potential simply because you are buying a put to hedge. The best solution to that is to pick a point in time where you are willing to take off the VXX put hedge and get a little more aggressive to the short side. 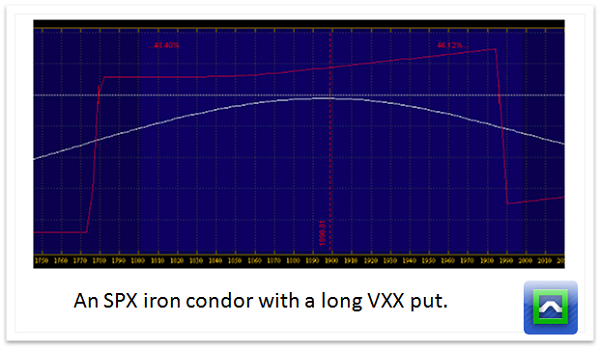 Initializing an iron condor with a short VXX position isn't always going to be the best trade, and it does require nuance. If it were easy every time, there wouldn't be an edge. Gotta put in a little work. After a big market selloff. Many times when I've lost big on an iron condor trade, it's after the market has seen a huge rip after a selloff. By buying puts in VXX, you can get a "double whammy" on the trade with vol collapsing in VXX as well as the implied volatility going lower on your put spreads. If volatility is bid in a weird way. Sometimes, the market's gut feel is that something is going to happen. Sometimes, implied vol gets bid up on both the call and put side. This is a great time to do this pairs trade, because you'll have an instance where the market can drop but VXX continues to go lower as traders who bought vol to hedge have it peeled off. Slow seasons with high contango. If we're coming into the holidays or are on the tail end of earnings season, the market tends to slow down a bit as liquidity drops off. If contango in the volatility futures remains high, you'll get an extra kicker of profits from the drag that happens in the VXX. These are all advanced considerations, but those three times are the "sweet spot" for this setup.